Experience the incredible hospitality of the North Platte World War II Canteen, America’s most heartwarming homefront story. On December 17, 1941, North Platte residents gathered at the Union Pacific Depot because they heard that a troop train carrying their own boys – Company D of the Nebraska National Guard – would be coming through. When the troop train stopped, it was Company D all right, but of the Kansas National Guard, not Nebraska. After a few moments of awkward silence, the townsfolk surged forward to share their gifts with the Kansas boys – after all, they were someone’s children, and away from home at Christmas time. 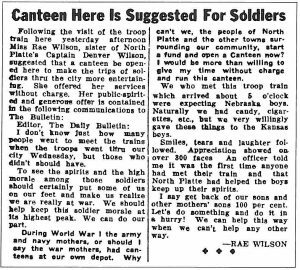 That night, young Rae Wilson went home and penned a letter to the editor asking North Platte to follow the lead of their ancestors in World War I and open a Canteen at the depot. Little did she know that she would be starting an endeavor that would last for 54 months, involve 12,000 volunteers and serve more than 6 million service men and women. At the Canteen Experience you have the opportunity to look through the database that is filled with names of the soldiers that signed the guest book when the train stopped in North Platte. The index has over 6,000 names out of the 6 millions service men and women who stopped during World War II. You will also be able to peruse some of the hundreds of letters of appreciation that have been received in North Platte over the past 70 years. 5:00pm – The museum is home to the World War II Canteen Exhibit as well as the Prairie Village. The western prairie village is complete with a working blacksmith shop, railroad depot and telegraph, Fort McPherson cabin, Pony Express Building, county church, one room school house and much more. Stepping into the village is like stepping back in time 100 years. 5:45 pm – Told by a Canteen Historian, Jim Griffin. The Museum features the official North Platte World War II Canteen exhibit, which tells the story of local volunteers who served more than six million service men and women throughout World War II. The North Platte Canteen is known to have been the single biggest movement of volunteerism in the United States to date. 6:45 pm – Enjoy good, old-fashioned cooking that may include items that would have been on the Canteen menu. Fried chicken, homemade pies, even a Canteen favorite – Popcorn balls! 7:45 pm – Board your motorcoach to return to your hotel. **Tours can be customized for any group. The North Platte Canteen Experience: starts at $30 per person for 35 people of more. The shootout/robbery, dinner menu, and both tours can be customized for any group. Please email Amanda Connick at [email protected] or call at 308-221-6864 if you have any questions or would like more information. Throughout World War II, thousands of Nebraska women greeted the troops in North Platte with songs, smiles, and hot food. A UNION PACIFIC wrecking ball destroyed the brick building on Nov. 1, 1973, and now freight trains rumble just a few feet from where for 51 months thousands of dedicated women and teenage girls greeted millions of U.S. troops with hot food, warm smiles, and heartfelt prayers before they headed off to the horrors of World War II. There are many railroad tales in Nebraska, but the most moving story of all is the inspiring and patriotic deeds of those female volunteers at the North Platte Canteen. Many of these servicemen had never heard of the town when they arrived, but they would never forget it when they left. Some 70 years later, 10 minutes of kindness at the Union Pacific Railroad depot in North Platte remains a treasured memory for grateful GIs all across America. Some had been traveling for days, had no money, and it was their first trip from home. Then their bellies and hearts were filled in North Platte. During almost 50 years as a reporter at the North Platte Telegraph, Sharron Hollen wrote many stories on the Canteen, including dozens of interviews with World War II veterans who wrote letters of thanks to the town decades later. “Some of them were saying I just had to say thank you before I died,” recalled Hollen, who as a baby played in a basket in the Canteen while her mother served as a volunteer. Hollen who retired in 2011, had also pored over hundreds of thank you letters sent during the war. One came from an officer who said the Canteen was the last good meal his soldiers had for 2 ½ years. Union Pacific’s commuter service ended in 1971, but on Christmas Day, 1941, until April 1, 1946, nearly 7 million precious passengers rolled into the depot. These men and women of the military were greeted 24 hours a day with doughnuts, coffee, pies, and even pheasant sandwiches at the former UP restaurant. For more than four years, including months after the war’s end, nearly 55,000 Nebraskan women served those who bravely served America. Bonnie Glo (Brown) Aubushon of Brady was a teenager serving boys not much older than she was, handing them birthday cakes, and passing out oranges, and their favorite treat, deviled eggs. She also got their addresses and wrote letters to them. When a couple hundred soldiers dashed into the depot there was bedlam. Two thousand brave souls stopped here each day. They knew the journey was heading into the darkest of tunnels, but for 10 minutes there was light. They had found their way back home in North Platte. Our satisfaction guarantee: It’s simple. We guarantee that you will be 100% delighted or your money back for remaining issues in your subscription. Tell us about a business you saw advertised in Nebraska Life Magazine, and how you enjoyed using their goods or services – you could be one of our winners!